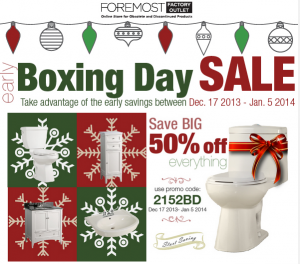 Shop at Foremost Factory Outlet Online Store for their spectacular early Boxing Day Sales. From December 17th 2013 through January 5th 2013 you will receive 50% off absolutely everything in their Online Store! Foremost Factory Outlet is the online store for obsolete and discontinued products. Simply use the promo code 2152BD at checkout to receive an additional 50% off your total purchase. Limited to one promo code per order. Foremost's products are available while supplies last. Shipping is only available to Ontario and Quebec Residences! Shop at Foremost Factory Outlet Online Store for their spectacular early Boxing Day Sales and receive 50% off while supplies last.